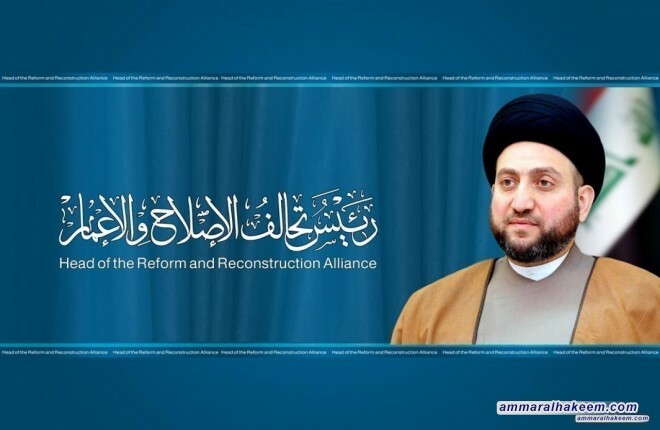 Head of the Reform and Reconstruction Alliance, Sayyid Ammar al-Hakim, described the Religious Authority guidance heard by Special Representative of the United Nations Secretary-General for Iraq, Mrs. Jeanine Hennis Plasschaert, a road map to contain the crises with all its implications, pointed out that all found themselves in front of a legitimate, national and moral mission. And announced his total commitment to the guidance of the Higher Religious Authority. His eminence stressed the need to abide by the Religious Authority sound guidance, providing services to citizens, fighting corruption and reconstruction of cities, especially Basra Al-Fayhaa, state control over weapons and maintaining the security of citizens disregard of their affiliations. And building balanced relations with countries of the world based on common interests, stressed respecting the sovereignty of Iraq, and refusing making Iraq a platform to attack any country in the region, or a yard to settle international disputes and intersections, reiterated his invitation to all parties to meet around one table to solve issues, create a joint comprehensive national course of action, in order to restore confidence of the citizen and keep the prestige of the state.